Thank you so much for visiting our registry site! 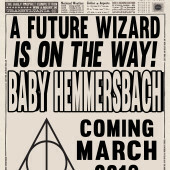 We are beyond excited to meet Baby H. Baby's nursery is a combination of woodlands & Harry Potter!!! We will be cloth diapering - please consider donating to our cloth diaper fund rather than buying disposable diapers. Also, if you are able to find anything on our registry that is lightly used - please feel free to do so! Just contact us or someone close to us (if you want it to be a surprise) so we can remove the item from the registry!